So many significant achievements made 2016 memorable—and arguably the greatest in sports history. That made this year's Sportsperson selection even more difficult. In the end we could choose only one winner: LeBron James. You can make a case for sports itself as the 2016 Sportsperson of the Year. How many tweets, Instagram posts, memes, GIFs, Vines (RIP!) throughout the year began and ended with that single word? Leicester City has pulled off the impossible. Cleveland’s long championship nightmare is over! The Cubs’ long championship nightmare is over! Every month, it seemed, unlocked a new watershed moment, a little bit bigger and more dramatic than the previous one, a sort of Russian nesting doll in reverse. Who, in January, would have been so bold to divine that both the Cubs and a team from Cleveland would win a championship, or that a 5,000-1 shot would win the English Premier League championship? Other, less shocking events—the continued Olympic excellence of Bolt, Phelps, Ledecky and Biles; a record-tying seventh NASCAR championship for Jimmie Johnson—bolstered a powerful argument for this being the Greatest Year in Sports. 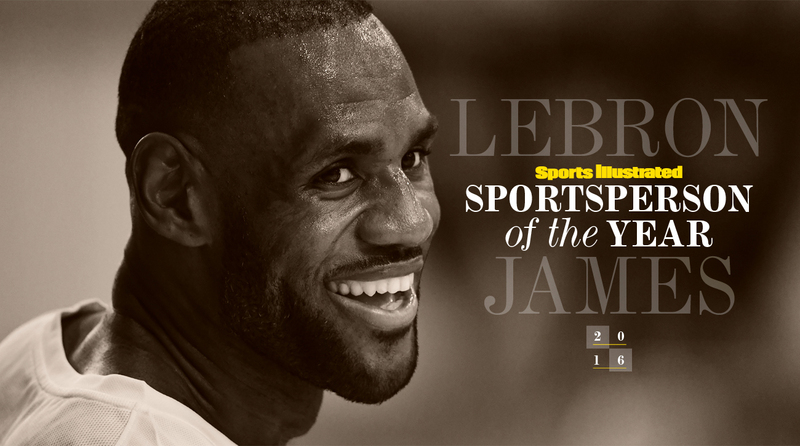 In the end we could choose only one winner, which brings us to the 2016 Sportsperson of the Year, LeBron James. He, of course, was not the only athlete to help end a famous title drought. He wasn’t even the only athlete to be part of a comeback from a 3-1 deficit to end a famous title drought. He is, however, the only athlete who did those things to gain more than a ring. In putting the Cavaliers on his back in the NBA Finals he also fulfilled a promise to his home city and to an entire region. He was following through on that heartfelt, but risky, vow he made three summers ago when he returned home after four successful years in Miami. ​​ LeBron James certainly did not save Cleveland or northeast Ohio, but he lifted the area in unmistakable ways. In his forthcoming cover story on James that will post later today, Lee Jenkins dives deep into the transformation of a city’s image and the power that sports has to shape how an entire region views itself. (Aside from “Cleveland: City of Champions,” is there a more unlikely phrase than “J.R. Smith: Clevelander for Life?”) This award celebrates northeast Ohio as much as its does the region’s favorite son. In a very crowded year of Sportsperson candidates, the connection between player and community, his community, can be fairly described as the tiebreaking vote. But LeBron lent more to the 2016 sports story than his game. He lent his voice, too—fitting, because this Sportsperson honor—James’s second—also represents the impact an athlete can have beyond winning rings or medals. In his piece Jenkins points this out too: when James meets the media before or after games, he is willing to weigh in on much more than what’s happening in his own locker room and around the NBA. It could be something as mundane as the NFL’s falling television ratings; increasingly, it’s weightier topics such as Black Lives Matter, the need to help at-risk kids in Akron, or the presidential election. James has recognized, and embraced, the platform sports gives him to be as powerful off the court as on it. ​ Sportsperson is not a political honor. But if 2016 was among the greatest sports years ever, it was also a year to remind us that sports can be about more than, well, sports. Think of the courage of Colin Kaepernick. Think of the unapologetic feminism of Serena Williams. And think of the passing of Muhammad Ali, The Greatest for reasons that only began with his championship belts. LeBron James is not Ali—no one is. But like Ali, and in his own way, he wears the mantle of the athlete in full. That is also the mantle of a Sportsperson.